Scent Laboratory: Scent as a material or as a phenomenon? Scent as a material or as a phenomenon? An excerpt from my presentation at The Experimental Scent Summit / Art and Olfaction Awards, on the May 5th, 2017. I raised my interests as question : Scent as material as phenomenon? Coming from Japan and working a lot in the olfactory art scene in the West, I sometimes get a feeling being lost in the contexts. For example when people talk about perfume as a standard platform of scent culture, I feel different. I try to illustrate, with my words, the context where I live. In the West, it is quite normal to wear perfume as social manner, but in Japan it's not. We have longer tradition in incense. We even have developed sophisticated games for olfaction and literature, Kodo, more than 1000 years ago. In the West you wear perfume for identity and for self expression. This creates a domain around you. We in Japan first respect others, and the space between us. We use incense to share time and space. It function almost as a medium for communication. So if one overpower the space by his/her overwhelming perfume or bodily scent, this creates a problem. One might say it's one of the Japanese original concepts called "ma". Western people have much stronger body odor than us Japanese. So using perfumes to mask the body odour is accepted socially. We have little body odor, and on top of that, we have a habit to bathe daily to wash away the body odour. Scents are used more for the others. For ancestors in buddhism ceremony (for purification of spirits, and respecting them), and for guests as hospitality. Incense is lit long before guests come, so that he/she can enjoy the trace of scent left in the space. Smoke disturbs the olfaction so burning it in presence of guests is to be avoided. 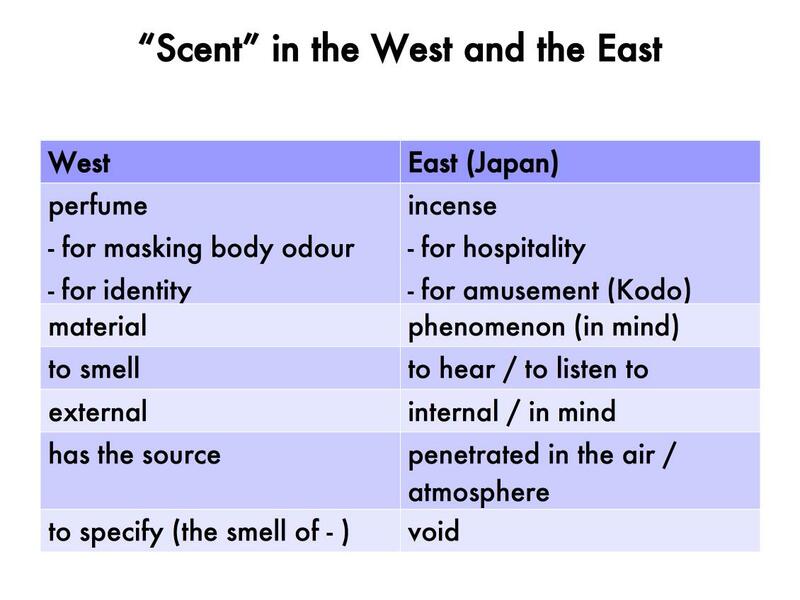 In the West, a scent is a material. It has the source, you can specify the source, you can name it, and you can even specify the chemical components. When you smell something you try to specify it: "what is this scent?". You might find a pot of hyacinth on the table: you can specify the scent source. And the chemical structure is pretty known: benzyl acetate, phenyl ethyl alc., etc. Scent is an object itself and at the same time material that you can control. It's something visible. Scent created by incense is penetrated in the space, hanging in the air. You might notice it, but you might not. The scent exists only for one's mind who can detect it and appreciate it. Normally we don't specify what the smell is, because we know that what we are smelling is a mixture of the space odor and season's fragrance from plants in garden, etc. We smell it more like looking at a scenery. We simply appreciate being "inside" of the scents. We also smell scents in mind. For example when you say a word like "osmanthus", it implies not only the season (often defined in protocols of classical poems) but also implies the scent too. 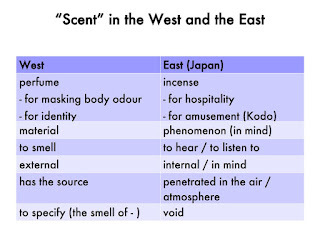 In Kodo games in contrary, we have to specify and distinguish the scents. We use the verb "to listen to" for smelling with this critical attitude. These are questions, or just my interests raised from my observation. I would simply like to share with my fragrant friends. Comments are welcome.